Heat the butter in a heavy based pan, add the onions and cook slowly, stirring occasionally, until evenly browned. This will take about 15 minutes. Stir in the flour, add the stock, bay leaf, salt and pepper and bring to the boil. Simmer gently for 20 minutes. Toast one side of each of the bread slices and lay, toasted side down on a baking sheet. Cover each with a portion of the cheese and press down. Place under the broiler and toast until the cheese is browned and bubbling. 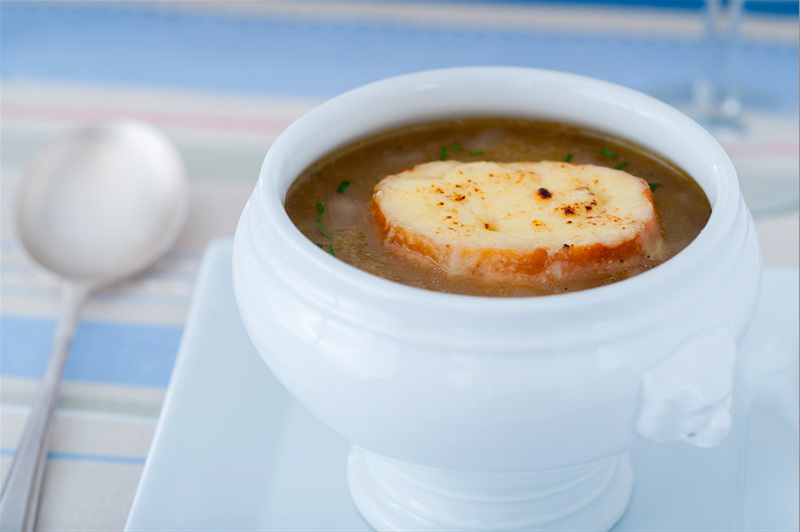 Pour the hot soup into bowls and lay a piece of cheese toast in each bowl on top of the soup.